If all the toy ads, over-the-top decorations (starting in October! ), and incessant credit card use are bringing on the holiday blues, try creating some new holiday memories that are fueled by compassion, not commercialism. These simple traditions will not only let you share important values with your children, they will also lift your spirits. It's guaranteed: your kids will treasure these memories long after their once-coveted toys are broken or forgotten. The holidays are a perfect time for memory making. Here are ways to get started. 1. Gather loved ones for a service project at home. You have so many options for helping those in need: assembling care kits, making sandwiches,downsizing rice and beans, tying no-sew fleece blankets, creating pet toys or decorating wooden Stars of Hope for communities struggling with disasters. If you include extended family, perhaps you can forgo your traditional gift exchange and have everyone pitch in to purchase the “ingredients” for your project. 2. Cultivate gratitude. The holidays are such a whirlwind, it helps to have excuses to pause and notice what matters. Create a gratitude jar or gratitude garden, or read stories that inspire thankfulness. In December, spend a few minutes each day with our Hunger Calendar. 3. Take each of your children on a kindness date. This is a great opportunity to talk individually with your kids about why you value kindness. You might buy flowers and deliver them with a holiday card to a children's hospital, care facility, or veteran's home. Or go toy shopping for Toys for Tots. After you donate your unwrapped gift at a drop-off location, stop for a cup of hot chocolate. Or bake cookies together and deliver them to neighbors or your local fire station or police department. 4. Host a holiday party centered around giving. Assemble card-making supplies and have your guests create holiday cards for our overseas troops, a care facility, or a children's hospital. Or ask each guest to bring a pair of socks, mittens or a hat to donate. Hang each donation on a line around your house as your guests arrive. 5. Create a DIY kindness calendar. Count down the days until Christmas, Hanukah or the winter solstice by doing one small act of kindness each day. Pick out colorful envelopes or small bags, one for each day, and hang them on a clothesline. Write a small act of kindness on cards, put one in each envelope/bag, then choose one to complete each day. 6. Give "kindness" gifts. Choose gifts that spread joy and compassion. 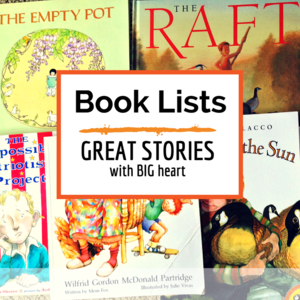 Pick out big-hearted books for everyone on your list. Or give gifts that teach giving, like the For Purpose Kids Do Good Starter Kit, a service activity, or a cooperative game. Ask questions that encourage reflection from children. What's most important to you about the holidays? Why? What might we do to focus more on giving during the holidays? Name someone outside the family that you're grateful for and explain why. How might we let that person know? What do you wish someone would thank YOU for? If you were to make a list of what you wanted to give, rather than what you wanted to get, what would be on the list? Another tradition to consider: One night each week throughout the holidays, gather the family, make some popcorn, hot cocoa, or s'mores; light a fire (or candles); and cuddle in blankets while you read (and then talk about) a holiday tale or any big-hearted book from our collection. Picture books are treasures for any age, and can be used to start BIG conversations about kindness, gratitude, compassion and empathy -- values that have traditionally defined the holidays. "The holiday season is the perfect time to reflect on our blessings and seek out ways to make life better for those around us."